Rick Herter was commissioned by the 74th Fighter Squadron, the World Famous Flying Tigers, while they were still deployed and in combat over the skies of Afghanistan in 2013. 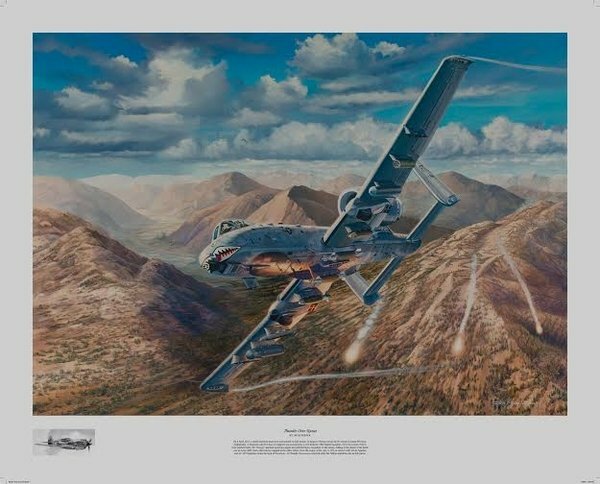 The squadron wanted a specific battle created by the artist and the result is his finest A-10 piece to date, Thunder over Kunar. Early on the morning of 6 April 2013, a small American team in Kunar Province, Afghanistan became surrounded by a much larger enemy force. Taking heavy fire and in danger of being overrun, the American element called for Close Air Support; the call was answered by A-10s from the 74th Fighter Squadron. Working in close coordination with AH-64 Apaches and AC-130 gunships, the several flights of “Hawgs” located, marked and prosecuted numerous enemy positions on the high terrain. When a Quick Reaction Force convoy was sent to extract the American team, it, too, took heavy fire from the surrounding mountains as it bottlenecked in the treacherous passes. The 74th pilots worked throughout the day to break contact with the enemy, expending 5,470 rounds of 30 mm cannon and 4500 lbs of ordnance in a firefight that lasted eight hours. The A-10s remained overhead until all friendly forces were extracted; the Taliban ended the day in full retreat, having suffered over 50 casualties. The overall print size is 26 1/2" High x 33" Wide. The print image area is, 21 1/2 x 30"